Thank you for offering the floor to the NGOs. We are really delighted to learn that 105 NGO participants registered for this eight Session of the IGC. Never before has there been such a strong NGO participation to the IGC-Meeting. This reflects the growing and more structured engagement of the NGOs in the implementation of the Convention within its governing bodies but also beyond. Needless to say our recently established website ichngofoum.org has been a major contribution to such conscience raising. 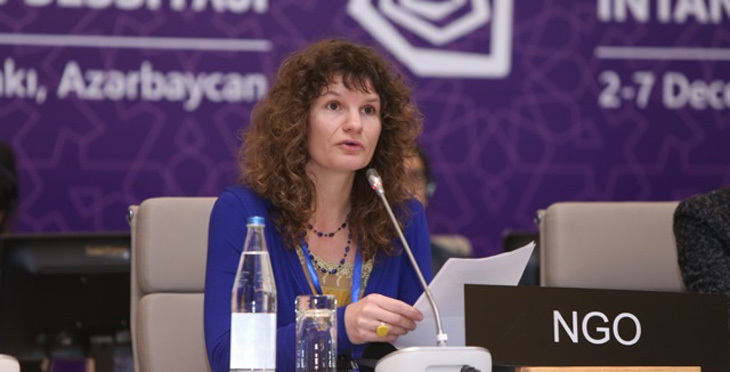 On behalf of the NGO Forum, I bring you a short report of the 4th ICH NGO FORUM Symposium which took place in Baku on Sunday December 1, 2013, as a sort of preamble to the 8COM meeting. First of all, we wish to thank the ICH Section of the UNESCO Secretariat and the hosting State party, Azerbaijan, for their generous reception and extensive support they have been offering, assisting the NGO Symposium with a conference room, interpreters, live webcast, coffeebreaks, lunch, technical assistance, etc. 65 representatives of NGOs and several state observers from the 6 regions of the world participated in yesterday’s meeting. This illustrates for the accredited non-governmental organizations, the high relevance of this annual day-long Symposium and Meeting to exchange experiences and strengthen their cooperation towards the 2003 Convention. The NGO Symposium this year, decided to focus on the role and potential contributions of NGOs to the implementation of the UNESCO 2003 Convention, wishing to contribute to the Baku IGC session debates by bringing in the diverse experience and ideas of associated NGOs. Of course, they are looking in particular at Agenda Item 14 on the profile of the NGOS accredited and the nature of their work, and on the proposal of an evaluation form for assessing the NGOs potential contribution to the implementation of the Convention. Ananya Bhattacharya (Banglanatak, India) reflected on the role of NGOs in linking ICH to sustainable development in a strategy of cultural skills. Antoine Gauthier (Conseil québécois du patrimoine vivant, Canada) illustrated how ‘measuring’ ICH and its results and effects can strengthen the implementation of policies and support for ICH in the long run. Dr. Ani Casimir (CEPPER, Nigeria) turned to the assessment by indigenous people and civil society organizations of Africa of the IOS evaluation on the 2003 Convention. And finally Sumi Nam (ICCN, Republic of Korea) looking at the ICCN network experience, analysed how Local communities and governments are organizing themselves at the international level in the perspective of sharing practices in the implementation on the 2003 Convention. Each of the presentation shed a light on a different aspect of a number of the items at stake during this eight session of the intergovernmental committee. From yesterday’s presentations and debates, the NGO Forum hopes to contribute constructive proposals and perspectives to the debates of the Intergovernmental Committee in the next days. Several NGO working groups will work towards addressing specific aspects of the 8COM agenda and also developing cooperation with State parties and the Secretariat on safeguarding-methodologies, shared expertise and practices. We hope to have the opportunity to bring in NGO comments and possibly proposals at an appropriate timing in order to enrich the discussions and inspire the Committee’s decisions. Given the growing interest of a number of NGOs in participating in the Forum, the NGOs are also discussing the future organizational aspects of the NGO Forum. Finally, the NGOs wish the Committee members a very constructive working week, as 8COM promises to be a crucial IGC meeting addressing several decisive aspects for the future functioning of the Convention. It will be an opportunity to bridge some of the current challenges for making this so special Convention for living culture and diversity even stronger than it already is.